How do my friends and neighbors get to Cathedral Gardens? Take Interstate 95 south from Baltimore. Continue on I-95 past the beltway (I-695). About 2 miles past the beltway, take right onto I-195 (towards airport). From I-195, take right onto Elkridge exit to Route 1 (south). Go south on Route 1 for about 2 miles. From Route 1, take right onto Montgomery Road (at shopping center). Proceed on Montgomery Road about 1 mile. Take overpass over multilane expressway. A few yards past the overpass, take right onto Elibank Drive. The gates are kept locked. Contact the Cemetery Manager to find out how you may get in. Are there telephone numbers I can call? Call the Cathedral Gardens Secretary at (301) 963-2294, or the Cathedral Gardens Manager at (410) 931-1246. 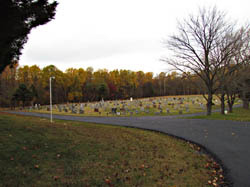 The Manager has information about purchase of burial lots. 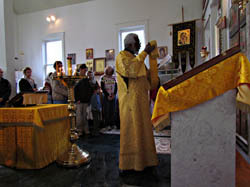 What happened to the Divine Liturgy in Slavonic that was being held each Sunday morning in the chapel? Right now, we do not have enough priests to continue this. If you know of someone who needs a priest who speaks Russian, have the person call Father John Vass at (410) 997-0802. We have a variety of softball, basketball, soccer, horseshoes, and other equipment. We do not always remember to bring it out. Ask for it! The permanently installed playground equipment such as slide and swings is always available. Why did you name a cemetery Cathedral Gardens? We didn't. The estate was already named Cathedral Gardens when we acquired it. What are the procedures for placing of monuments and other stonework? You need a permit from the Cathedral Gardens Manager for installing or removing monuments, footstones, vases, or other stonework. We have designated one company to prepare the bases for these items. Our present policy is that you can contract with any company to install the monument or other stonework on the bases. Footstones and vases must be placed at ground level except those erected prior to 1981.
Who is responsible for maintaining monuments and other stonework? You are. The only responsibility of Cathedral Gardens management is to mow grass in areas that can be reached by mechanical equipment. However, we do care about the stonework. If something is keeping you from maintaining your family plot, talk to us. We may be able to help. Do I have to know the number of my lot? Not absolutely. However, knowing your lot number will make procedures go smoother. The lots start with burial lot number one near the chapel and the numbers increase as you go downhill. Five foot wide paths and nine foot wide lanes alternate, going across tothe paved loop. We can help you find your number during any of the picnics. Who broke the stone vase at my monument? Nobody did. It is good if vases have a drain hole. If this hole becomes clogged, freezing water tends to break the vase. How can I find out what the weather at Cathedral Gardens is this very hour? The Maryland Highway Commission has an automatic weather recording device a few hundred yards from Cathedral Gardens.